Spread over 32 acres along the man-made lake, the 12 cottages have been meticulously planned and conceptualized with assistance from the vanguards of sustainable design - architects, Vasant & Revathi Kamat and designer duo Sahil & Sarthak. 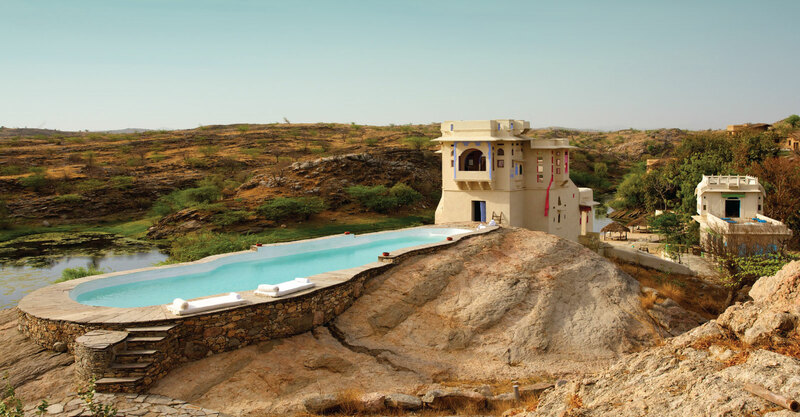 Merging Rajasthani design with eco sensibility,the twelve 900 sq ft mud and stone cottages, supplement the Mardana and Zanana and invoke an experience both private and symbiotic with nature. Influenced by the indigenous Rajasthani architecture, the cottages have been re-interpreted in sustainable design using locally sourced products like wood, stone and mud. Following zero kilometer concept and reflective of the 'slow' lifestyle of sourcing all materials from the vicinity, the architecture reflects the local way of living. The striking bright pink curtains, reminiscent of the local grab, flowing from the windows of the quaint hunting lodge creates a picture perfect impression as one enters the resort. Similarly, inside the grey slate and mud cottages made in a rough chinai style, the bedroom and living areas flow into one another. A similar flow continues towards the bathrooms, where an open door echoes with the ethos of non-divided spaces of rural homes. Every corner of the resort tells a story which is rooted in the authenticity of the locale.